It’s a fact of life that your Harley Davidson will receive unsightly dents, dings, or creases at some point in time. Whether it’s a skid, a tip, an accident or even a hail storm – dents happen. Rather than let these unsightly blemishes remain, many Harley Davidson owners look into dent repair and removal to restore the original beauty of their vehicles. Your two main options for Harley Davidson dent repair are a replacement or paintless dent repair. Though your Harley Dealership would be happy to send off your tank for a full replacement, it’s often overkill for simple dents and dings. Most body shops would only be able to use bondo and fillers that can affect and de-value factory-original equipment. They also are not able to match original factory paint as Harley does not release its paint codes. 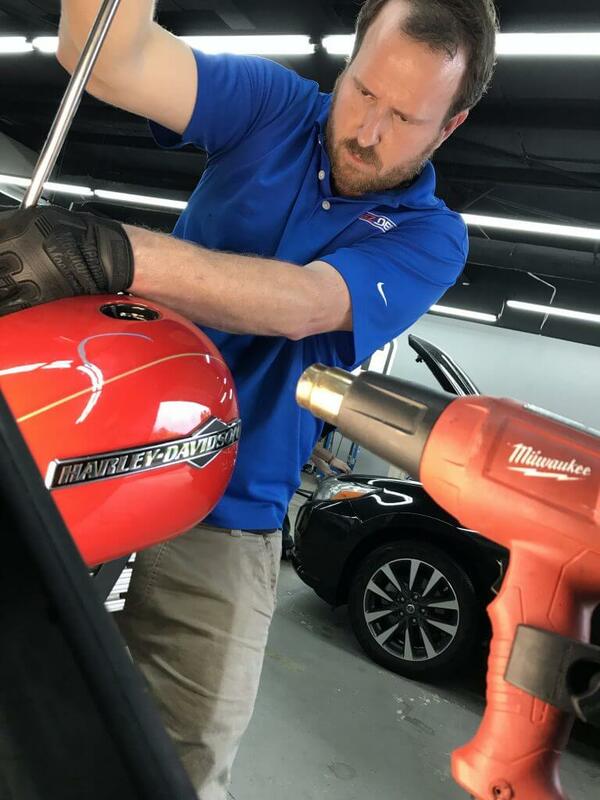 Paintless dent repair is the process of repairing dents, dings, and creases without removing body panels, using body fillers, or adding additional paint. At EZ Dent, located in Athens, GA, our paintless dent repair process consists simply of using special hand tools to push, pull, and bend panels back into place. Paintless dent repair for Harley Davidsons is an efficient way to restore body damage to your bike without requiring new paint or panels. Why Choose Paintless Dent Repair for Your Harley? Taking your Harley to the shop for repairs is a tedious and time-consuming process. EZ Dent is the solution to these woes. Since we specialize in dent repair – our process and versatility beats anyone else in motorcycle repair. The convenience of this is hard to beat. Our paintless dent removal technique is also far cheaper than the body shop or replacement route. We’ll repair your motorcycle’s dents and dings at a fraction of the cost. Plus, our specialized techniques are extremely fast and efficient. We have years of experience working on every make & model of motorcycle. Our shop has the equipment to handle your motorcycle – no matter where the dent is. Concerned about the drive & dropoff or the appointment scheduling? We’ll work with you! 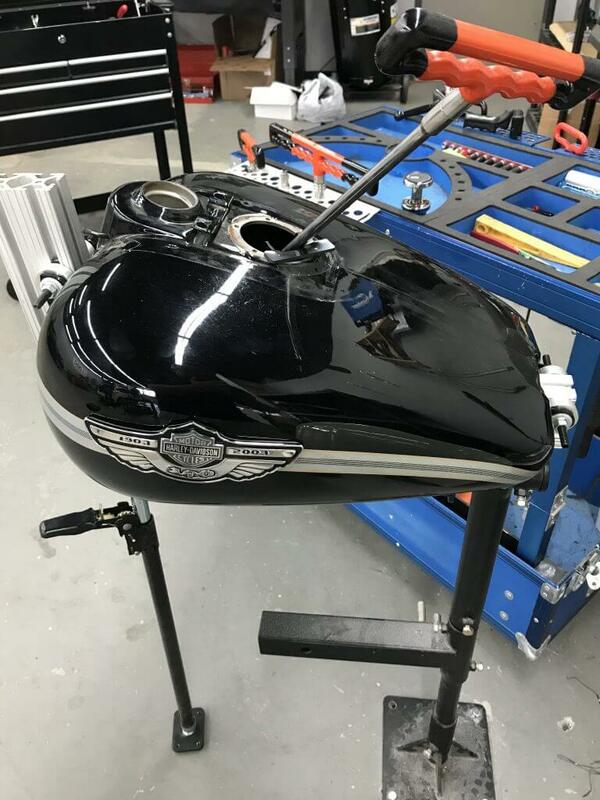 We’ve had motorcycle owners from out of state ship a damaged fuel tank to our shop for repair – and have been happy with the process. Our process and team is well-established, so we can provide a schedule that works for you. 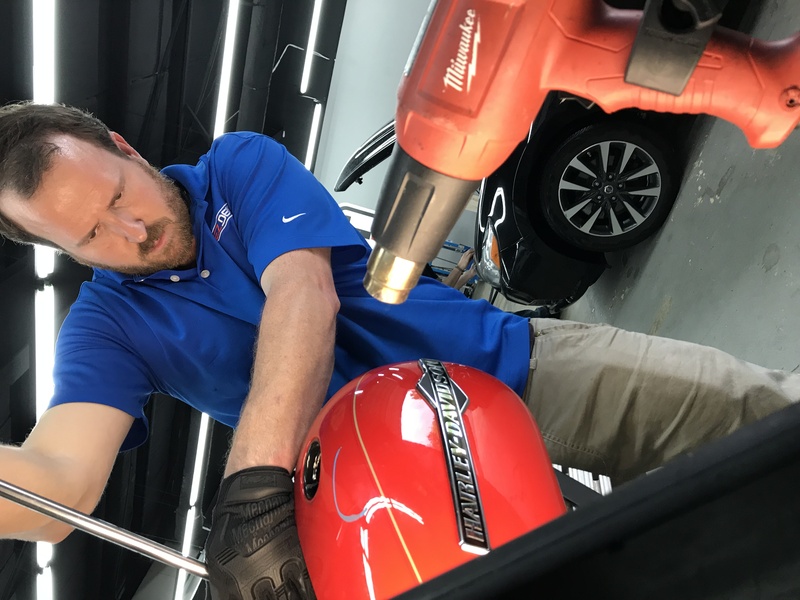 We have proprietary equipment & techniques for dealing with gas tank dents and years of experience assessing hard access dents & dings, so the process is known and transparent. No matter the model or location of your motorcycle – we will work with you to get your motorcycle back as close to factory original as possible. Interested in paintless dent repair for your motorcycle? Then contact us at EZ Dent today for your free quote.